I am always reading photographers' blogs out here on the internet. These guys and gals always come up with the neatest, most creative ideas. I finally came up with ONE half-decent something, and was proud enough about it to do a dedicated post. 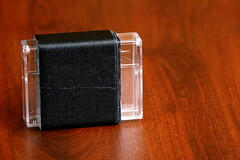 Simple as it is, this is a plastic MiniDV case, wrapped with about 10ft of Black ShurTape Gaffer's Tape. I am always needing a foot or two of this wonderful tape, but don't always have a full 60yrd roll on me. This small deal fits in my photo bag or in my pocket, and gets Gaff where I need it. Oh, and I hope you like the photo. You can see a setup shot here of how I set it up. Usually I see photos like this done in all-white, but I love the look of my coffee table. Simple, but I love it. Any readers that have a shared Gaff-Tape passion with me ought to relate to this Gaff-On-The-Go idea.